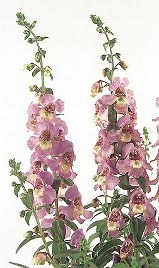 Tender perennial plants native to SOuth America and members of the Figwort family (Scrophulariaceae). Angelonias have undivided leaves and small two lipped blue flowers borne in the axilis of the leaves. 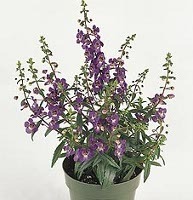 Angelonias should be grown in cooler climates as potted plants that can be taken indoors when temperatures become cool. Propagation can be accomplished either by sowing seed or taking softwood cuttings in the early spring. Seeds are sown in a soiless mix of 1 part sphagnum peat to 1 part sand. 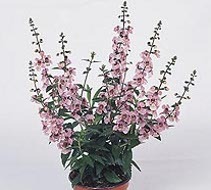 The medium is kept moist, but not soggy at a temperature of about 70F until the seedlings reach about 2 inches in height, when they can be lifted and transplanted to larger containers, or, if the outdoor temperature remains above 65F, outdoors in a prepared bed. Cuttings are taken from new growth, trimmed to about 2 inches in length and then inserted in sand or a medium of 1 part sphagnum peat and 1 part sand. 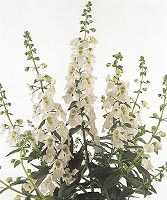 When well rooted, the seedlings are removed and planted in larger pots or, as for seed propagation, outdoors if the temperature does not fall below 65F.